And these are just some of the things that might take place. So, let's see what you should do in order to position your hands properly while playing the piano. The good thing to know about proper piano hand position is that it's not that hard to do. Actually, it's pretty simple and straightforward. The only problem is that it may take some time to get used to. It's not pleasant at first, and it may seem unnecessary, but you will eventually embrace it and incorporate into your playing. First of all, before even getting to the playing part, you'll have to relax your hands completely. Think of it as pre-workout muscle stretching. It's not the actual workout, but it's an integral part of it. And the most important thing is – you have to do it over and over again. If you don't prepare pre-workout by warming up, your muscles will develop inflammation, right? Well, it's the same with playing the piano. Every time you get round to playing, be sure to relax your hands first. This will prepare them for the strain they're about to experience - because it is a kind of strain. Furthermore, it's a good mental preparation, to get "in the zone" and focus on what you're about to do. 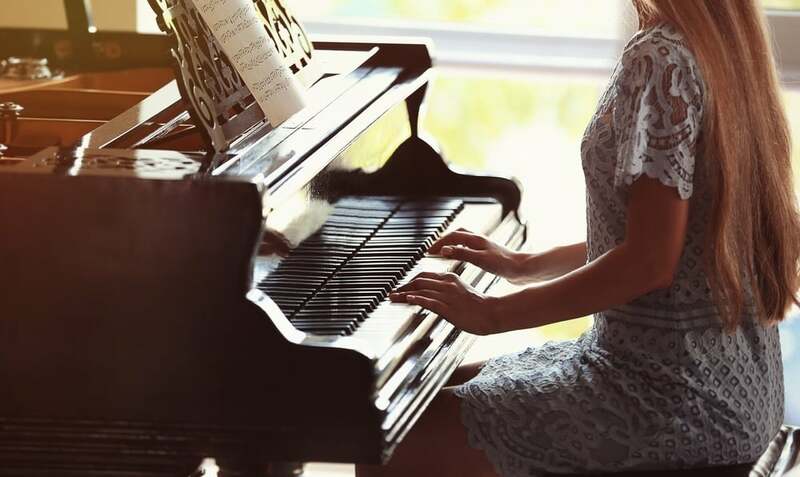 Therefore, be sure to commit to regular hand relaxation every time you play the piano – you'll see it pay off as time moves on. A good exercise is first-making – you form fists with both your hands, and them spread them as much as possible. Do this a couple of times in a row. You can also do a bit of rotation. Stand up, place your arms in front of you and rotate the palms, up and down, for about a dozen times. Another good practice is to spread your fingers as wide as possible, and then bring them back – joining them tightly. You can repeat this a couple of times as well. These exercise will get your hands well-prepared for playing. Another very important part is proper posture. You shouldn't sit too close, or too far from the piano. Also, the height of your piano stool should be adjusted so that you're comfortable. Mind you, there are no strict rules for any of these, as you yourself can only know if something feels comfortable or not. Plus, our bodies are slightly different, so minor adjustments are inevitable. That's a completely normal thing to feel, because it takes time to get used to the "new surroundings". But eventually, your body will accept it. Your hands should be able to press the keys while your arms are bent normally. Your feet should have no problem reaching the pedals i.e. you shouldn't stretch them at all. Your back should be straight and the keyboard just above your waistline. You should sit on the stool (bench) right in the middle, not in the back; this is important because you'll take a lot of strain off your lower back. If you got all of these things covered, chances are good you have proper posture. Also, what's very important is that you note any changes in any part of your arms and shoulders. If you feel a cramp, or too much tension, you should stop playing and loosen up that part until it feels better. Mind you, if a thing like this happens over and over again, you're probably not doing something right. Then, you should revisit your posture and make sure that you've done everything down to a tee. Here is how your hands should be placed on the keyboard so that they assume proper shape. All of these are equally important, so make sure you got them covered. 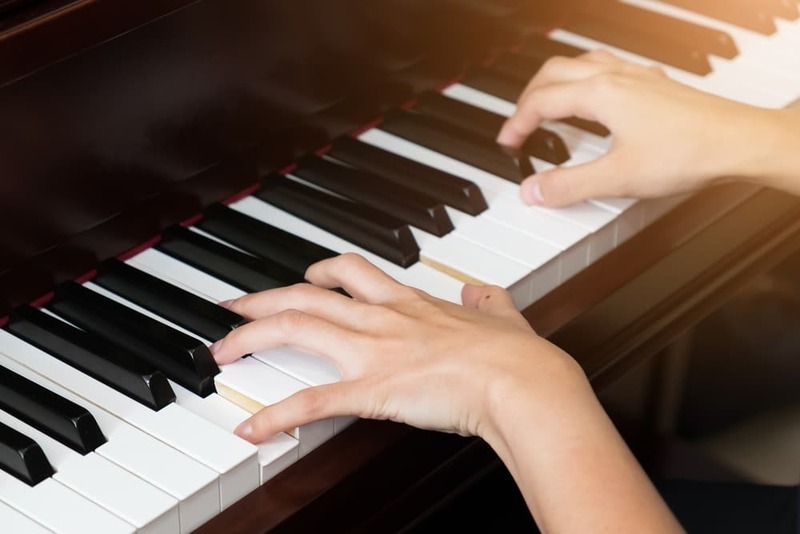 In order to play properly, you will also have to strengthen your fingers and hands, and there are a couple of ways to do this. You can buy some of those gripping devices, and practice for 10-15 minutes every day. 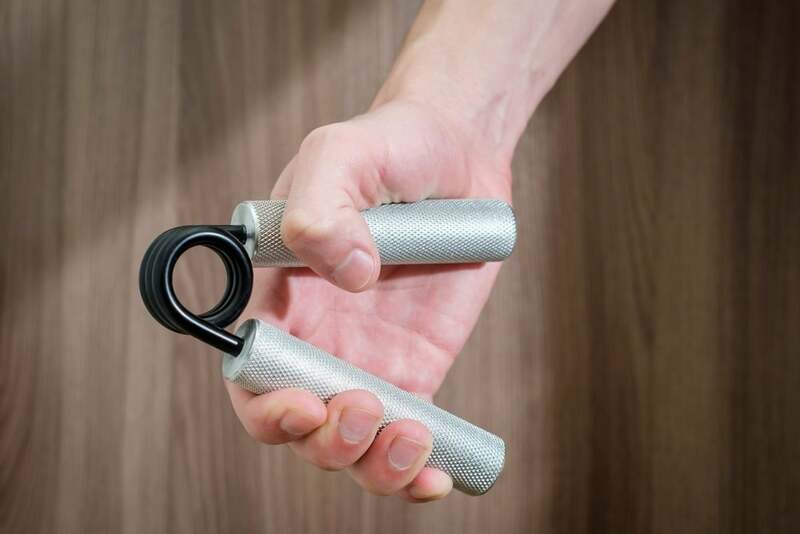 This will strengthen your grip and give extra force to your hands. These devices are fairly inexpensive, but they can really mean a lot to your playing. Be sure to use them before and after your playing practice, to achieve the much-needed balance. Also, another good way of practicing is – by pressing your fingertips upon a hard surface. For example, you can press them against the surface of your table. Mind you, you don't have to press too hard, only enough to feel some solid pressure in your fingertips. This will enable you to get your fingers used to regular pressure coming from the piano keys. 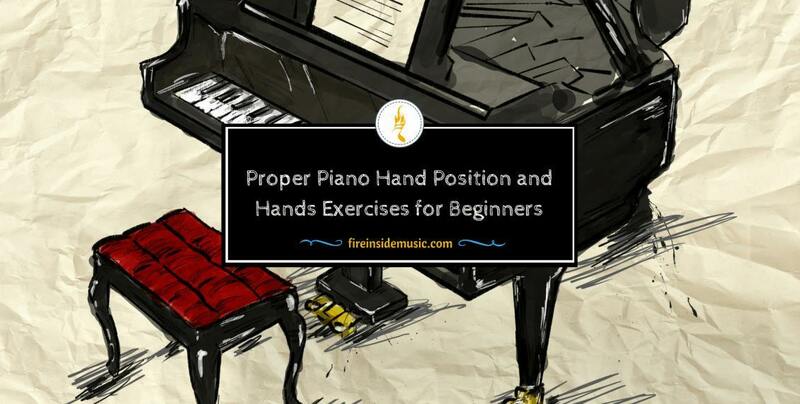 By applying these useful "exercises", you will get your fingers and hands in top-notch shape for proper piano playing. What to basically want to develop is the so-called muscle memory, which is the basis of all playing. After a certain period of time, the formations you use for playing, and the pressure you apply – become second nature to you. The brain doesn't think about it that much, as it becomes kind of – automatic. You will never be able to play confidently without strong muscle memory. 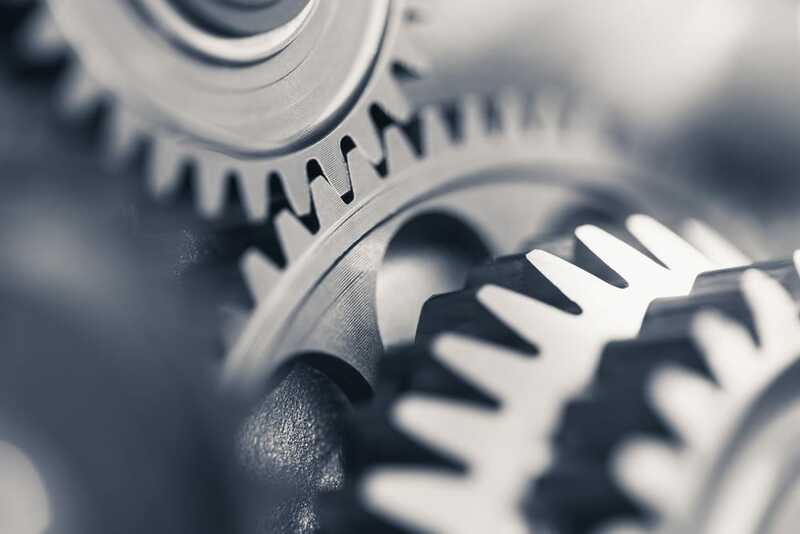 Here are a couple of ways through which you will develop it. Your hands do all the playing, but the interesting bit is that they're not the "power" behind the playing. The actual power behind your playing comes from the whole of your body, not just your hands. The hands are there to "execute the action", it's the wrists, arms, shoulders and, finally, the body, that are behind your playing. Also, you should allow gravity to "help" you along the way. Don't force your hands too much. Allow them to, in a figure of speech, fall onto the keyboard. The effort you put in the actual pressing should be at the bare minimum for the creation of sound. If you overstep that mark, you will actually force your hands and fingers too much, which will only end up causing you unnecessary strain. The dynamics of the piano are also extremely important for proper playing, and it is a field in which you should excel. The whole idea of dynamics is to control the force with which you press the keys. 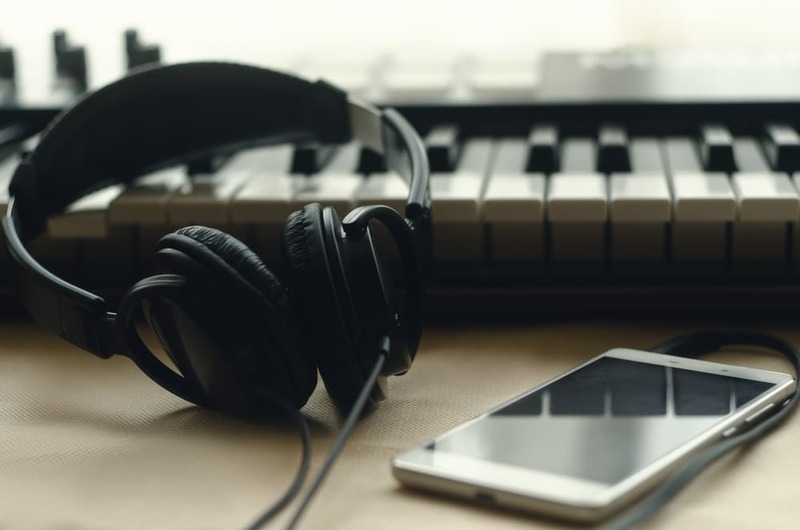 In most cases, the melody of a song is more important than the rhythm. However, there are instances when the rhythm is much more important, or equally important, as the melodic line. In these cases, the main part of the playing should come from the left hand, because it controls the accompaniment. This is why it's very important to know how to control the left and right hand respectively. You can practice this by playing a piece of music in two different ways. First, play it by emphasizing the melodic line – with your right hand. Then, switch over, and emphasize the bass line – with your left hand. Mind you, the hand that "leads" should always be a tad louder than the other one. Otherwise, you're not making any progress. This exercise is extremely useful for practicing the balance between hands. These two playing techniques are well-known in the music world, and for a reason. Don't let the foreign names confuse you; the whole idea is simple and straightforward. Basically, legato means – playing smoothly, without breaks and stops along the way. Staccato is exactly the opposite – playing notes in a broken way, one by one, separately from all the rest. Practicing like this can prove very useful, because your hands will develop a sense of rhythm and flow. 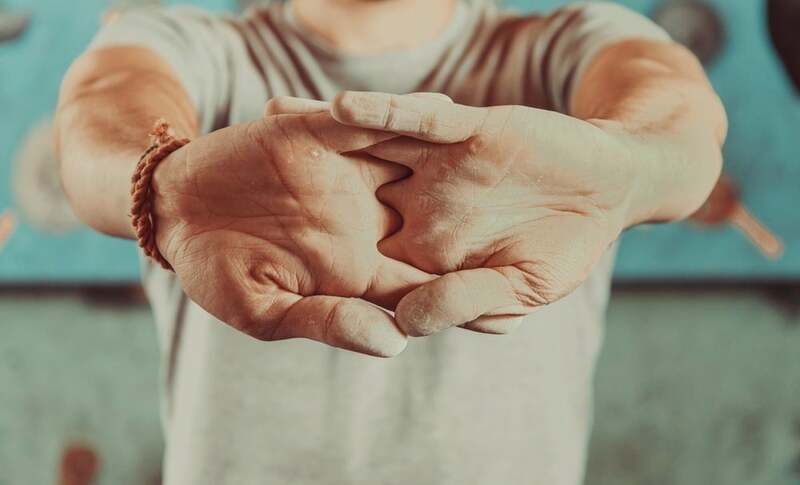 While practicing with these two techniques, be sure to keep a close eye on your hands. Sometimes, due to the difference in playing, the whole hand position can change slightly. The playing position of your hands should be same – no twisting or bending of the fingers and wrists are to be seen. This can only end up causing you pain, or even some injuries. Playing cannon basically means – starting to play a melody on the right and then joining on the left. But - and here's the tricky part – your left hand should be "late". You should keep your left-hand playing behind for at least a portion of a second, before you join in. This will create a sort of queasy feeling in your playing, and it will definitely sound interesting. Obviously, it's not that easy to actually do this, but you should start small and build up as you go. To be able to play this way successfully, you'll need good hand articulation. Obviously, good hand articulation is not something you have instantly. It is something that you will gradually develop. And by "gradually", we mean – day by day, over a period of time. If playing with both hands is difficult for you, even for simple melodies, you can try something else. Try playing with only one hand, either one- and start moving the other hand around. It doesn't have to be playing – you can just raise it above your head, slowly, and then get it back down. You can move it around the keyboard without actually playing something. You can also point to things in your room, or scratch your head, etc. Do anything that's the exact opposite of playing on the keyboard. Then, after a while, you can "up the stakes" by placing your other hand on the keyboard, just touching the keys. Eventually, start making chord formations with your fingers, but don't play the actual chords yet. Once you feel comfortable enough, you can move on and actually play the chords. By this time, your coordination and articulation should improve significantly. You should repeat all the steps for your other hand as well. After a while, you'll notice how your playing gets better and better. There is no exact time frame for this – you will practice as much as you need. Obviously, the fingers are extremely relevant for proper playing, because they will be the ones actually pressing the keys. What you should do is – learn the hand patterns. Patterns exist to facilitate the moving around of fingers on the keyboard. There are tons of tutorials on useful hand patterns, so make sure to learn as many of them as possible. Start with simple ones and move your way up. This way, you will loosen your fingers up and make them play the same note sequences over and over again. By applying this principle, your fingers will "learn" which roads to take and you'll have no problem moving on to more complicated pieces. Mind you, there are hand patters for both the left and right hand. Be sure to practice both of them, as the left hand is "in charge" of accompaniment, which is extremely important for full playing. After a solid practice period, or a couple of hours of playing the piano, it's important to take a rest. Because it's the same as with the working out. The growth and progress don't only happen during playing – it also occurs during the resting period. Our body needs time to adjust to the new surroundings, so give it enough time to do it. After a while, you'll notice how your hands immediately form the proper playing positions. 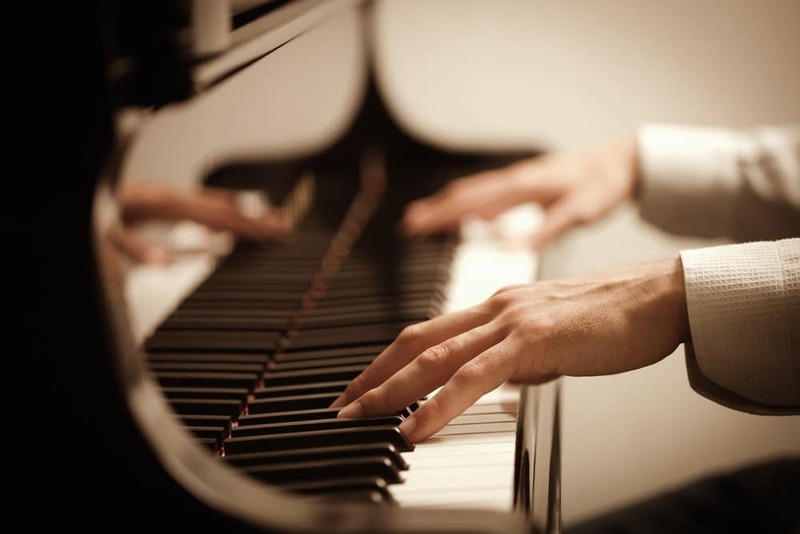 Therefore, value the resting time in between the two playing sessions – it's essential to your progress on the piano. If you're just starting out, don't over-practice yourself. The smartest way is to start small, and slowly increase your daily practice time.